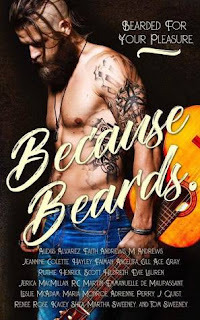 The Graduated Bookworm Blogger: Because Beards By: Alex Alvarez, Kacey Shea, Ace Gray, etc. Because Beards By: Alex Alvarez, Kacey Shea, Ace Gray, etc. Author: Alex Alvarez, Kacey Shea, Ace Gray, etc. My oh my Bookworms!! Honestly I found a loss of words when reading this, and it's from many different reasons!! First I want to thank all authors for collectively writing this Anthology, and for supporting a great cause! This is a novel of short stories written by some amazing authors that I've never read from, but am definitely going to be getting their books somehow!! If you had an opinion about beards, whether it be good or bad, let me tell you that this breaks all barriers! I don't even know how, but it has honestly left me thinking about beards all the time, and quite literally staring at almost any man with a beard...DANG!! So for this review, I am basically basing it off of the entire thing, not specifically any story, as they all held their own. Of course there were quite a few that are definitely on a higher realm of romance/erotica and then others that are more of a simplistic romance, but overall it was pretty amazing! So throughout the novel you go through various stories of characters dealing with their own circumstances. Can I just take a minute to say that the very first story I read was literally about an author and a beard.... #WOWZA You also see a lot of the stories go through different ages, different races, and sexuality. I really loved reading all of these stories that were based around none other than "THE BEARD" I loved how even though each story was written by a different author, they all somehow managed to have a name for the character who owned the beard. Holy sizzler of a novel! This is not a story that you read to your children, nor is it a story that you read in public while your face goes red! This book kept the passion, love, lust, and heat to a maximum and never seemed to really die down!! Just when I thought that it was over, BAM! In comes another steamy scene and I'm left red in the face, and glad I wasn't reading this on the bus. "And I can't deny that some part of me feels that fortune has been smiling on us." So I was able to grab just a couple quotes here and there that really kind of worked, but I just don't want to spoil some of these stories! So I'm going to leave this here, and tell you that this quote basically resembles my reading, as a fangirl, totally loving what has happened! Each story, obviously had their own take, but I found many to actually reveal a lot more than just a hot fling with a beard, but actually a history. In such few words, the authors were able to share these characters on more of a personal level and what is going on in their own lives, and it was just such a happy ending for me! Overall I really loved this book. Of course I will say that it's most definitely intended for 18+ because it's really...*Steamy*. It played with all of the heartstrings, as well as most likely playing with the fantasies of girls who love beards. Sometimes I found the stories to be a little out there, but it's also 2016 so really, you never know! I loved how all of the authors were able to write such amazing stories that many left me wanting to read more of! A lot of cliffhangers and I AM NOT OKAY WITH IT!! I loved every story, and the fact that there could be so many amazing stories about a girl and "a beard" and keep it entertaining the entire time! I found myself laughing out loud during some, and on the edge of my seat wondering what was going to happen next! Definitely a roller coaster ride of emotion, and thrill! I recommend this for sure!! Sorry, I just had to do this one!! That's all for my review today, I hope you enjoyed it! Such a great anthology, and clearly has the beard coming back full force!